1Arrhythmia Services, Schulich Heart Centre, Sunnybrook Health Sciences Centre, University of Toronto, Toronto, Ontario, Canada.2Arrhythmia Services, Cardiology Department, An-Najah National University Hospital, Faculty of Medicine and Health Sciences, An-Najah National University, Nablus, Palestine.3Cardiology Department, St. Michael’s Hospital, University of Toronto, Toronto, Ontario, Canada. Capturing symptom/rhythm correlation is crucial in patients who have rhythm-related symptoms. Evolving technology has led from 24 hour and 14 day Holter monitors to now external loop recorders to capture symptom/rhythm correlation. In patients with very infrequent and short-lived symptoms, the only recourse is an implantable recording device. Recently, patient activated recording devices have become available. These have the potential to significantly increase the duration for monitoring symptom/rhythm correlations. We report cases of using such devices to demonstrate some of the uses and challenges of this new ECG recording technology. Key Words : Recording Device, Ambulatory ECG, Diagnosis, Symptom/Rhythm Correlation. Correspondence to: Mohammed Shurrab, Arrhythmia Services, Schulich Heart Centre, Sunnybrook Health Sciences Centre, 2075 Bayview Avenue, Toronto, Ontario M4N 3M5, Canada. Patients who have rhythm-related symptoms usually have a need to record symptoms and rhythms in the same time frame. The use of an ambulatory ECG or Holter monitor for symptom evaluation has a diagnostic yield proportional to symptom frequency and with evolving technology has led from 24 hour to now 14 day Holter monitors to capture symptom/rhythm correlation. The arrival of external loop recording devices in the late 1980’s increasedthe diagnostic yield to approximately a 25% range,1 again related to the symptom frequency and the ability of the patient to tolerate continuous or intermittently applied skin electrodes. We report four typical cases of using such devices to demonstrate some of the uses and challenges of this new and potentially disruptive advance in patient and marketing driven ECG recording technology. A handheld ECG device that captures a modified lead II ECG recording was used. The device has two contact electrodes for each thumb and records a modified lead II ECG which is uploaded to a central recording site or can be recorded to the patient’s desktop. Record duration is 30 seconds (with storage of up to 20 recordings). The validity of a thumb electrode record to accurately reflect a modified lead II has been established.5 Patients are capable of making records whenever symptoms occur. Further details about the current iteration of this device can be found at the manufacturer’s URL (http://www.theheartcheck.com/products/pen_device.html). 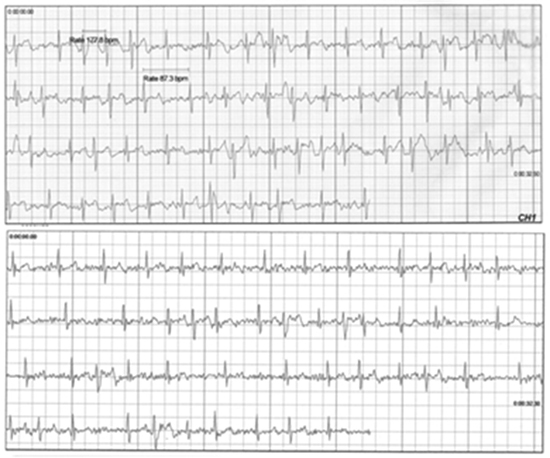 A 29-year-old man, morbidly obese otherwise healthy, presented to Emergency Room with rapid atrial fibrillation. By history he was thought to have a rapid regular rhythm that then degenerated to an irregular rhythm. Resting and stress echocardiograms, as well as Holter monitoring, were unrevealing. On September 19, 2004, an electrophysiogical study documented a difficult to induce typical AVNRT at rate of 250 bpm. An uncomplicated slow pathway ablation procedure was performed with the unproven hypothesis that typicalAVNRT preceded bouts of atrial fibrillation. He did well for the next 9 years. In September 2013, he had bouts of symptoms suggestive of typical atrial fibrillation that were not documented. 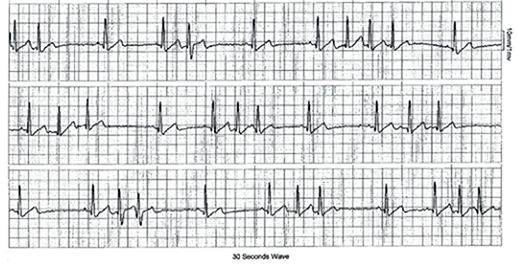 ECG evidence of atrial fibrillation was detected in November 2013 with ongoing infrequent episodes. He was offered and declined pulmonary vein isolation (PVI) procedure and given his symptom burden and the perceived risk-benefit ratio opted for medical management instead opted for medical management. He declines a beta blocker so flecainide monotherapy was started along with aggressive efforts towards weight control. Sleep studies showed no OSA. He acquired an ECG recording device to record recurrent arrhythmia symptoms symptoms while on flecainide (Fig 2). Recurrent bouts of atrial fibrillation were recorded. 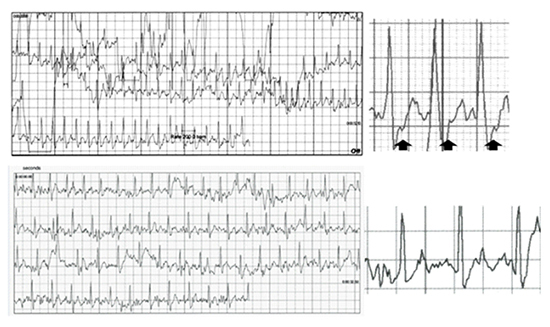 His symptoms were not radically different, and the arrhythmia was not showing signs of organization. A beta-blocker was added, and he eventually underwent uncomplicated pulmonary vein isolation (PVI). He continues to use the same ECG recording device in follow-up. A 35-year-old presented with longstanding proximal perimembranous restrictive VSD, which produces a high velocity peri-cuspal small left-to-right shunt. On MRI, the shunt jet causes prolapse of the right coronary cusp into the right ventricle (RV). The RV was normal in size and function, and the QP/QS ratio was calculated at 1.8, consistent with a left-to-right shunt. He had longstanding highly symptomatic ventricular ectopy, which 12-lead ECG suggested was localized to the right ventricular outflow tract (left bundle branch morphology, inferior axis, transition lead V3, coupling interval 390 ms). Ectopy was shown on the Holter monitor to be isolated, typically less than 500 beats per 24 hours with no diurnal variation. 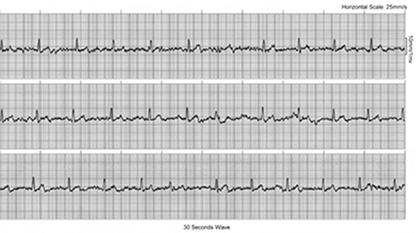 Symptom – rhythm correlation using a home ECG recording revealed that some but not all symptoms were related to ectopy. His highly symptomatic but infrequent ectopy was a source of psychological stress, mitigated in his view by the ability to obtain and document a signal of on-going reassurance from an ECG recording apparatus. He had been offered and declined an ablation for rhythm the emergency room. He had intolerence or inefficacy with trials of rhythm suppression and symptom control with bisoprolol, sotalol, verapamil and diltiazem. Flecainide starting at 50 mg BID and titrated to a 100 mg dose improved his symptoms with no significant QRS prolongation. He continues to monitor for recurrent symptoms, and to date there has been no evidence of pro-arrhythmic effect from his therapy. A 54-year-old man presented with infrequent paroxysmal atrial fibrillation in the setting of mild treated hypertension, absence of structural heart disease and inducible ischemia, and with normal BMI and a normal sleep study. Episodes of sustained arrhythmia were rare, occurring only once in 3 years. He was offered and declined a PVI ablation or continuous medical therapy for prevention of highly bothersome but infrequent bouts of arrhythmia. He preferred a pill-in-the-pocket oral pharmaco-conversion approach to management with an intent to take flecainide 300 mg as a single oral dose in the event of arrhythmia recurrence.9 He received a recording device in February 2013. With this device he frequently documented bouts of nonsustained atrial tachycardia. He has found reassurance in being taught how to recognize their reoccurrence and is satisfied with his sense of control of rhythm and symptoms (Fig 4). The era of new devices for arrhythmia detection and subsequent monitoring has arrived. The embrace by some patients (or their concerned families) of novel technologies has started. The use of such devices, directly marketed to patients, may exceed clinical experience, familiarity or even proven clinical evidence of efficacy in outcomes such as symptom control and appropriate health resource utilization. Importantly, it remains to be seen how such devices might influence therapeutic decisions. At the same time there have been advances in devices to record and generate an irregularity signal, but as cases 1 and 3 demonstrate, documenting changes in heart rate or providing a statement of irregularity may not be adequate or equivalent to the utility of having an actual ECG signal. For cardioembolic stroke prevention due to atrial fibrillation, the alternative is a presumption of atrial fibrillation based on Holter atrial ectopy counts. Such methods have decreased diagnostic precision in predicting atrial ffibrillation to the 30-40% range in post-stroke patients.14,15 The safety of new anticoagulation may allow such relatively poor diagnostic precision to still be useful as a surrogate for the decision for anticoagulation therapy in post stroke patients however this is an area of ongoing research that may be replaced by long term home ECG monitors used in this study. There are some challenges related to the use and interpretation of the recording devices. The devices’ utility depends on patient self-recordings. As a result they require patient attention and certain awareness, which might be challenging when the patient is distressed with the arrhythmic event at the time of the recording. Providing patients with a recording system to monitor their own dysrhythmias can lead to neurotic behavior. Patients can become quite anxious over their heart health and may have a worsened psychological quality of life. While interpreting tracings from these devices, physicians sometimes face a significant number of tracings with artifact that are difficult to interpret. The large number of recordings can be cumbersome for providers to sift through. Without an automated automated recording/evaluation system such as those included with Holter monitors and loop recorders, providers may find themselves overwhelmed with data. There are a few recording devices in the market that are conceptually similar to our device. AliveCor is a similar device using only lead 1 for recording. This is not an ECG device but rather a sensor that records a single lead using paddle electrodes which can be mounted onto a mobile device. The recordings are transmitted to the mobile device via Bluetooth. Unlike the device discussed in our report, AliveCor does not currently include ECG analysis software; operators can only scan ECG documents produced by the accompanying application. Ultimately, the evolution of these devices might improve many of the current limitations in the near future. 1. Better research to show proof in healthcare utilization benefits and other benefits that are clinically relevant but more difficult to evaluate (e.g. health-related quality of life, measures of autonomy and control, etc.). 2. Ongoing discussions on costs of healthcare delivery with a device that is directly marketed to patients and families by for-profit companies. The cases presented illustrate the utility of patient-activated home recording devices in the diagnosis of arrhythmias and long-term monitoring of safety related to antiarrhythmic medications. They further highlight some of the challenges pertaining to utilization of these novel devices in routine electrophysiology practice and offer insights into the future of symptom/rhythm correlation. Brown A P, DawkinsK D, DaviesJ G. Detection of arrhythmias: use of a patient-activated ambulatory electrocardiogram device with a solid-state memory loop. Br Heart J. 1987;58 (3):251–3. Langer A, DanonA, NewmanD. Home Monitoring to Identify Arrhythmia Concerns: The Promise of Personal ECG Screening. CONGENITAL CARDIOLOGY TODAY . 2013;11:1–10. Svennberg Emma, EngdahlJohan, Al-KhaliliFaris, FribergLeif, FrykmanViveka, RosenqvistMårten. Mass Screening for Untreated Atrial Fibrillation: The STROKESTOP Study. Circulation. 2015;131 (25):2176–84. Lowres Nicole, NeubeckLis, SalkeldGlenn, KrassInes, McLachlanAndrew J, RedfernJulie, BennettAlexandra A, BriffaTom, BaumanAdrian, MartinezCarlos, WallenhorstChristopher, LauJerrett K, BriegerDavid B, SyRaymond W, FreedmanS Ben. Feasibility and cost-effectiveness of stroke prevention through community screening for atrial fibrillation using iPhone ECG in pharmacies. The SEARCH-AF study. Thromb. Haemost. 2014;111 (6):1167–76. Haberman Zachary C, JahnRyan T, BoseRupan, TunHan, ShinbaneJerold S, DoshiRahul N, ChangPhilip M, SaxonLeslie A. Wireless Smartphone ECG Enables Large-Scale Screening in Diverse Populations. J. Cardiovasc. Electrophysiol. 2015;26 (5):520–6. Laish-Farkash Avishag, ShurrabMohammed, SinghSheldon, TiongIrving, VermaAtul, AmitGuy, KissAlex, MorrielloFlorence, BirnieDavid, HealeyJeff, LashevskyIlan, NewmanDavid, CrystalEugene. Approaches to empiric ablation of slow pathway: results from the Canadian EP web survey. J Interv Card Electrophysiol. 2012;35 (2):183–7. Shurrab Mohammed, Szili-TorokTamas, AkcaFerdi, TiongIrving, KagalDarren, NewmanDavid, LashevskyIlan, OnalanOrhan, CrystalEugene. Empiric slow pathway ablation in non-inducible supraventricular tachycardia. Int. J. Cardiol. 2015;179 ():417–20. Shurrab Mohammed, NewmanDavid, CrystalEugene. Empiric slow pathway ablation in suspected but not proven AVNRT: Reply to letter from Dr. Yetkin. Int. J. Cardiol. 2015;188 ():–. Alboni Paolo, BottoGiovanni L, BaldiNicola, LuziMario, RussoVitantonio, GianfranchiLorella, MarchiPaola, CalzolariMassimo, SolanoAlberto, BaroffioRaffaele, GaggioliGermano. Outpatient treatment of recent-onset atrial fibrillation with the "pill-in-the-pocket" approach. N. Engl. J. Med. 2004;351 (23):2384–91. Schwartz Peter J, WoosleyRaymond L. Predicting the Unpredictable: Drug-Induced QT Prolongation and Torsades de Pointes. J. Am. Coll. Cardiol. 2016;67 (13):1639–50. Engdahl Johan, AnderssonLisbeth, MirskayaMaria, RosenqvistMårten. Stepwise screening of atrial fibrillation in a 75-year-old population: implications for stroke prevention. Circulation. 2013;127 (8):930–7. Gladstone David J, DorianPaul, SpringMelanie, PanzovVal, MamdaniMuhammad, HealeyJeff S, ThorpeKevin E. Atrial premature beats predict atrial fibrillation in cryptogenic stroke: results from the EMBRACE trial. Stroke. 2015;46 (4):936–41.